Blueberries are in the grocery stores now and have amazing flavor. This topping is wonderful on vanilla ice cream. You can always make your own ice cream, but if you buy it, look for very few ingredients, cream, milk, sugar, vanilla. If the list of ingredients is long, put it back and find a good one. In a saucepan, combine the blueberries, water, sugar and salt; cook and stir over low heat until sugar is dissolved. Bring to a boil. Reduce heat; simmer, uncovered, for 7 minutes or until the berries burst. 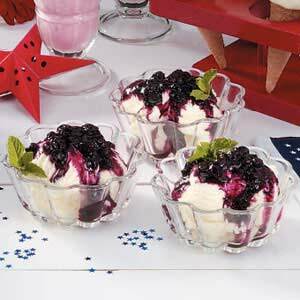 Combine cornstarch and cold water until smooth; stir into hot blueberry mixture. Bring to a boil; cook and stir for 2 minutes or until thickened. Remove from the heat; stir in the lemon juice, vanilla and cinnamon. Serve over ice cream. Yield: 1-1/4 cups.